Bear needs out! He's stuck at the vet, needing his bill paid. Bear is an older German Shepard that was taken in by Happy Hearts Rescue. 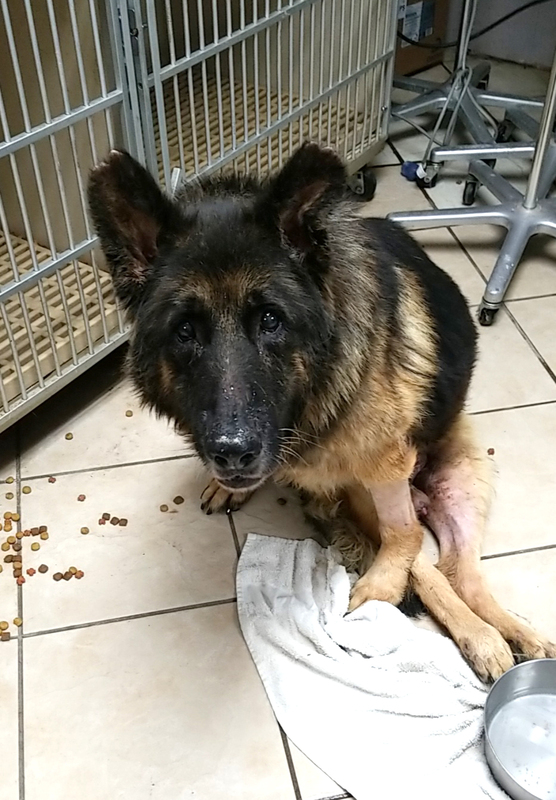 He was languishing in the Moreno Valley Animal Shelter, not walking and in pain. 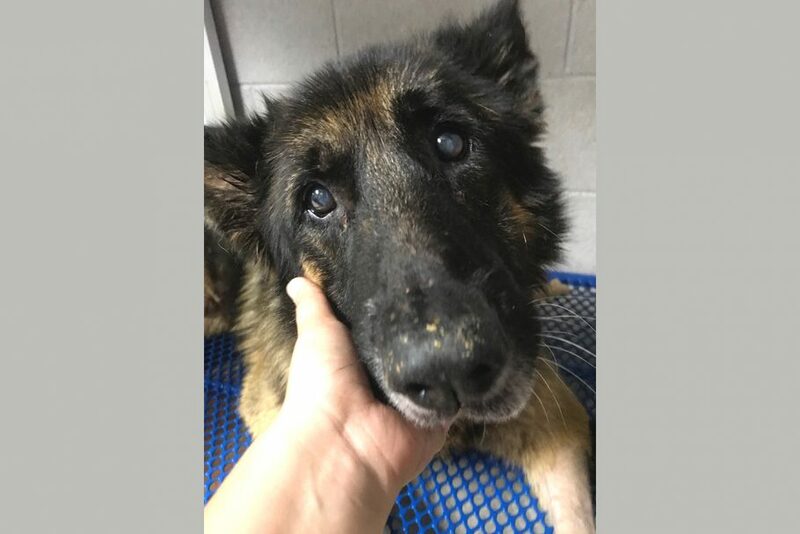 The rescue got him out and to a vet that did a basic examination, and then suggested that he see another vet as Bear’s condition was to difficult for them to deal with. There was no charge. Next Bear was taken to SoCal Animal Hospital in La Puente. Here Bear got more treatment. It was determined he probably has a slipped or damaged disc in his back, that has left him paralyzed in the rear. He cannot pee on his own, and cannot stand up. The vet has been treating him and he is still hospitalized there, but he needs to see a spinal specialist next. S o what is the problem? Unfortunately the rescue is out of funds and the vet will not release Bear without payment. The bill is $700. What we want to do is raise enough money to pay Bear’s current bill and then get him a consult with the spinal specialist. Bear may be a candidate for surgery. He may not even need surgery! Of course, it may also be that his condition is too poor, and he will need to be humanely euthanized. But we want him to get the best chance by seeing a spinal specialist before any decision is made! Can you help Bear? This fundraiser is to get him out of the vet he is in and into a consult with an excellent spinal surgeon in Orange County. The rescue has raised a little money, including at a GoFundMe, but they just do not have enough! All funds will only be used for Bear, and if the funds are not used, will be refunded! Thank you!! Thank you for giving him a chance. Bear deserves a chance. I would like your address. ive been in dogs all my life.Its hard to believe any vet would do this for he or she took an oath don’t do any harm if you can’t do any good ! I wish I could help but I can’t I may be looking at chemo again.I don’t see why a vet would hold this dog when doing so just adds up a bigger vet bill.This vet could write off this vet bill on their taxes if they,d realised this too.vets in the south do it all the time when dog belongs to a dog rescue ! I hope bear gets out of this vets jail in my eyes soon ! Come on people. Open up your HEARTS AND YOUR WALLETS. BEAR needs are help. Please, everyone, let’s get Bear out so he can go quickly to a specialist. Whoever is in charge, please email me. I want to help. You got this, Bear !! Would like Bear to have a fighting chance. 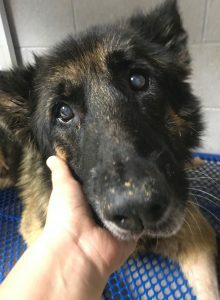 I have had 3 paraplegic senior GSD dogs. laser light therapy, and Walkinwheels before 85% recovery was established. Sadly a Stroke took her life suddenly 11 months after going through all that. Bear will likely live a happy life with a commited Foster or Adopter. What is your address? I will send a check out today…. For your protection, we advise against exchanging any personal info, like the changing of addresses and phone numbers, here in the comments section. Contact us and we’ll make the connection! Praying for you baby boy! Because I love animals and want him well and out of pain. I wish I could donate more! Because I love anima…ls and want him well and out of pain. I wish I could donate more! Thank you for giving… him a chance. Sadly Bear suffered from a series of seizures on Sept 26th and did not survive them. He has passed away. We are arranging refund for all donors. Donors have been emailed at the email used when donating. If you did not receive this email, please email RYAN at ryan@freeanimaldoctor.org with the Subject: BEAR REFUND.